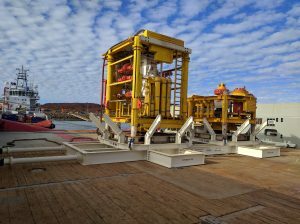 Offshore operators regularly transport heavy equipment to and from offshore locations/facilities for maintenance and construction activities. 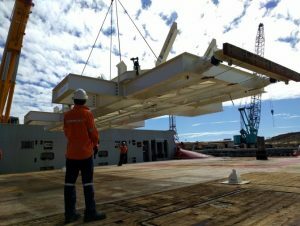 To securely “seafasten” the heavy equipment to the deck of the supply (transport) vessel a bespoke steel grillage is usually welded to the deck then cut off and scrapped after a single use. Going through this process for every voyage is expensive and wasteful because it generates sub-contract management, interface management, bespoke design engineering, site welding / hot-work, waste and safety issues. 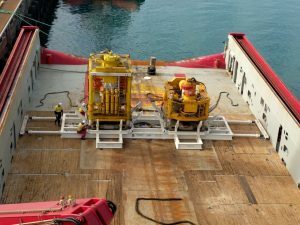 Woodside recognised this inefficiency and led a competitive tender for the concept, design & manufacture of a re-usable seafastening grillage which could fit a range of AHTS vessels and did not need hot-work for installation i.e. installed by their own technicians on site. 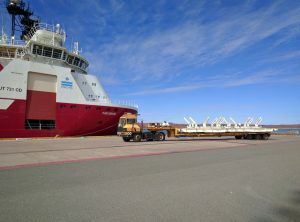 Cube’s solution was to provide a generic design that could be installed on several vessel types and used mechanical seafastening to replace welded seafastening. 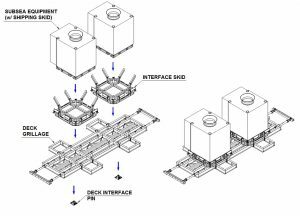 Cube’s design was considered by Woodside to be the best in class and were engaged to design and supply the seafastening system. Seafastening grillage installed. 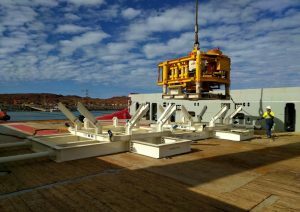 Subsea equipment being lifted onto grillage. Equipment landed & locked into seafastening grillage – ready for transit.